Questions? Custom builds? We build and support all of our boards. If you have a special application, we may already have a solution for you. Give Ron a Call at 513-874-4796 or 513-638-0228 for additional information. 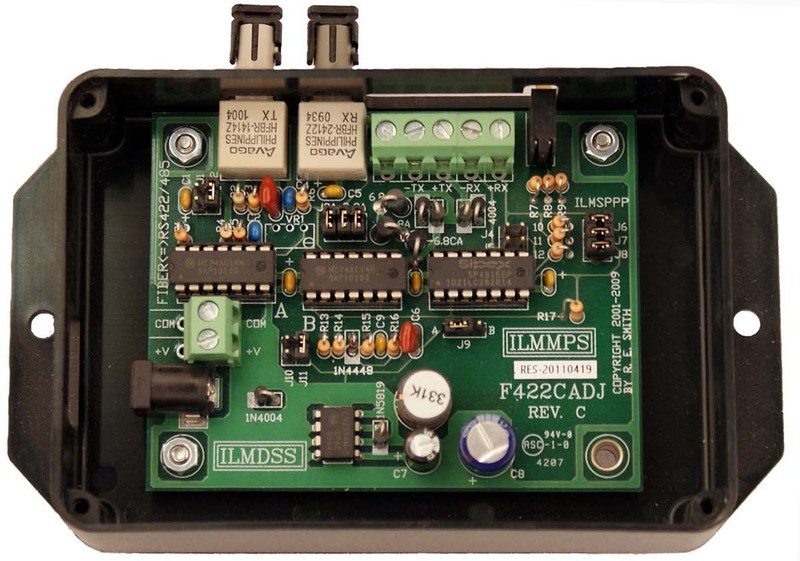 This unit features full duplex serial conversion(4 wire RS422), or half duplex(two wire RS485), to a pair of ST 62.5 micron multimode ports. Functionally identical to the F422CT, at a reduced cost, for use in less harsh environments not requiring the internal opto isolation, yet maintaining the fiber high isolation features. 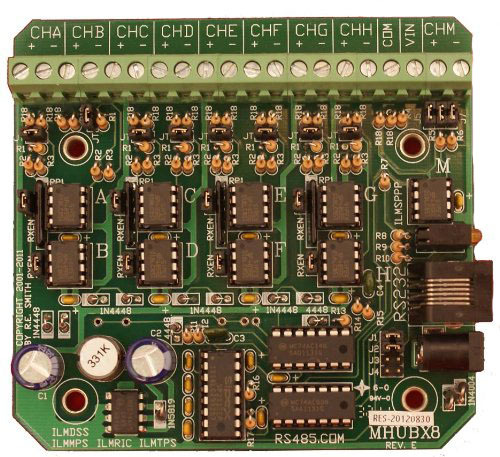 If the application requires RS485 two wire half-duplex only, the F485C and F485CT units can be an even lower cost solution. As an "Extension Cord", a pair of these units can extend the range of a RS422/485 communications link to 1Km minimum, typically 1mile, through a fiber link. The inherent noise immunity of the fiber cable allows reliable communications in environments that are hostile to other methods. Optimized for non-isolated office/indoor point to point or multi-drop systems. Transparent to all asynchronous data, with any combination of data, parity, and stop bits, at data rates up to 1Mbps. Faster speeds are available, in this, and our other products. No Jumpers or settings ordinarily required. 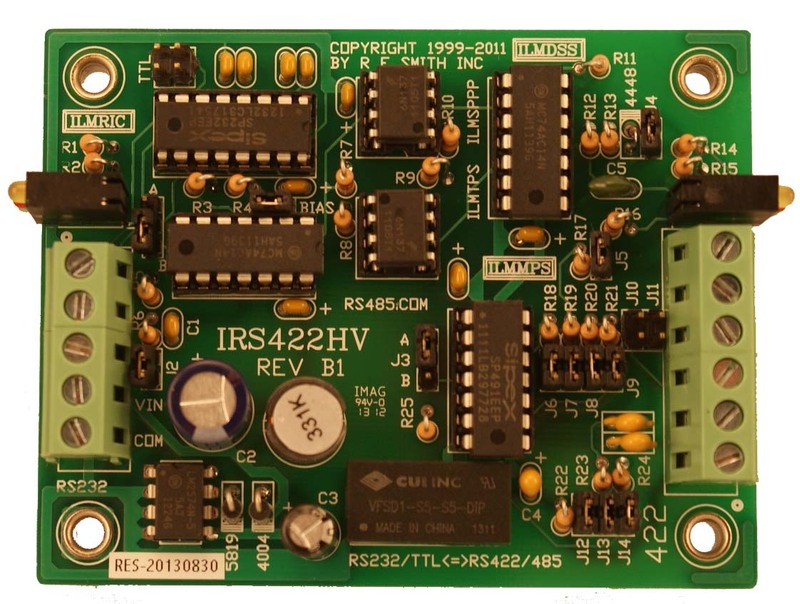 In RS485 configuraion, fast auto turn-around, from transmit to receive mode, requires no software delays and eliminates timing problems and data collisions. Jumper J10 can further shorten the turn-around time to accommodate fast responding target devices. Jumpers J6, 7, and 8 permit the termination and bias resistors to be user configured. Jumpers J2, 2A, 3, and 3A allow the fiber transmitter power, and receive bandwidth, to be adjusted for short fiber distances. 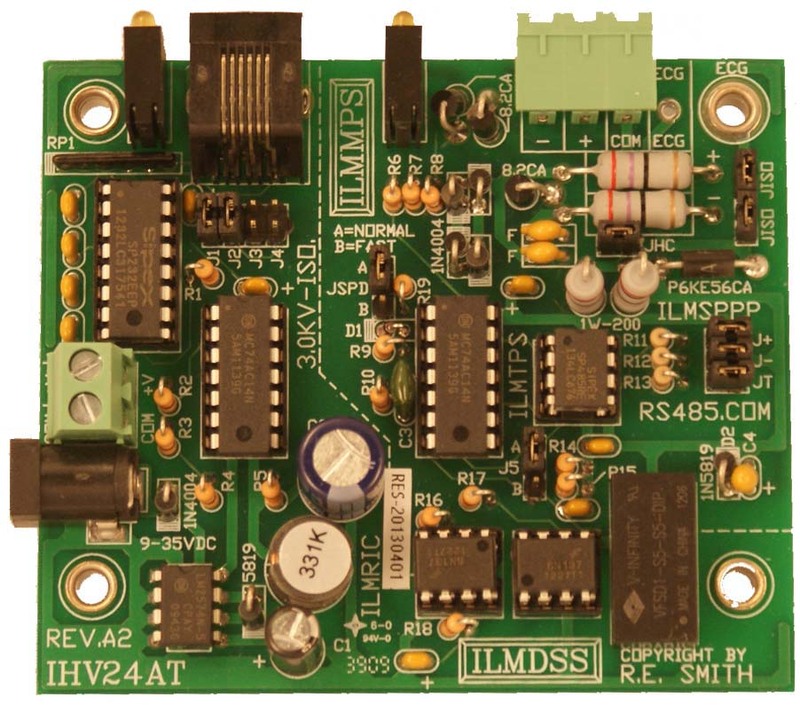 The robust RS422/485 driver, and a full wave transcient suppression bridge, provide protection, and allows 32 standard loads at 4000 ft. at all data rates. Four(4) easy mount through hole standoffs, which accept #6 hardware, are provided on the circuit board. User connections are the two fiber ports, a 5 position removable or non-removable screw terminal strip for the RS422/485 port, and a terminal strip and barrel connector for the input power. 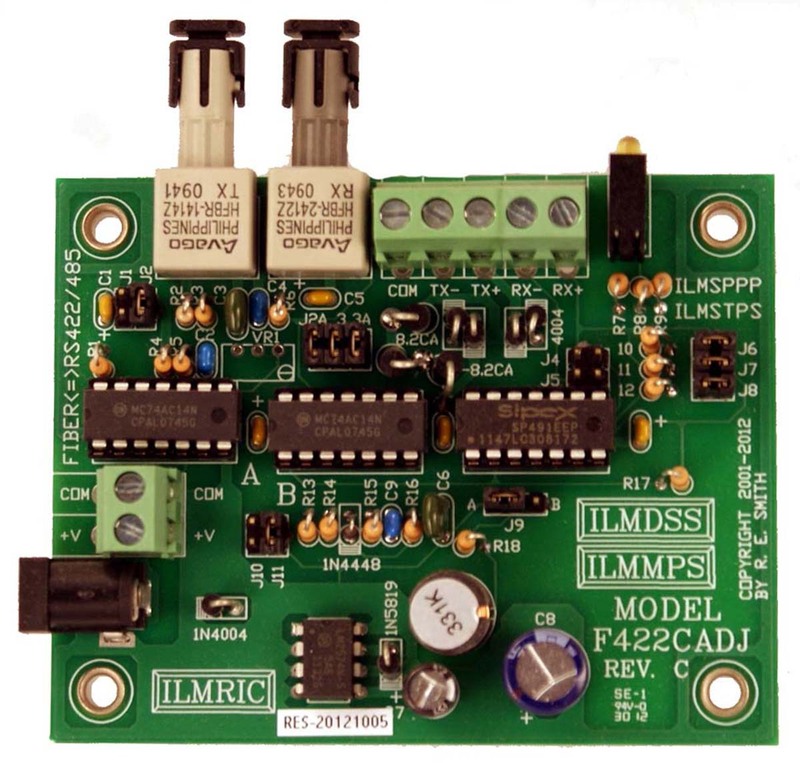 Accessories available are an enclosure, a wall wart power supply, fiber cables, and conformal coating. Contact us for options help. 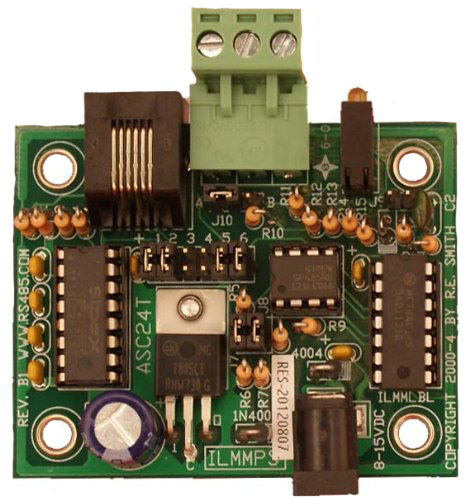 R E Smith Inc makes a wide variety of isolated converters that address the electrical noise problems that contribute to unreliable communications, and product failure. If what you see here is not exactly what you need, don't hesitate in calling us at 513-874-4796. 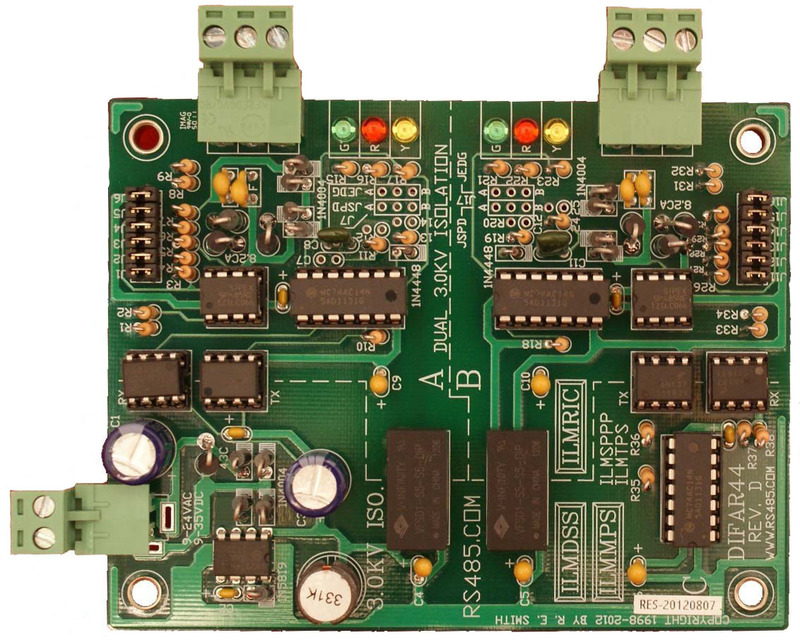 We also have a new series of Converters and Repeaters that extend the RS485 communications distance far beyond conventional limits. Contact us for information on these leading edge problem solvers. WARNING: Do NOT connect this device to a telephone system under any circumstances. 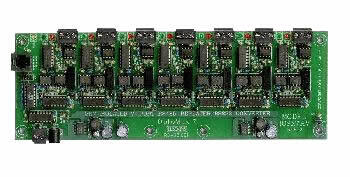 Damage could result to the circuit board and/or your telephone system. 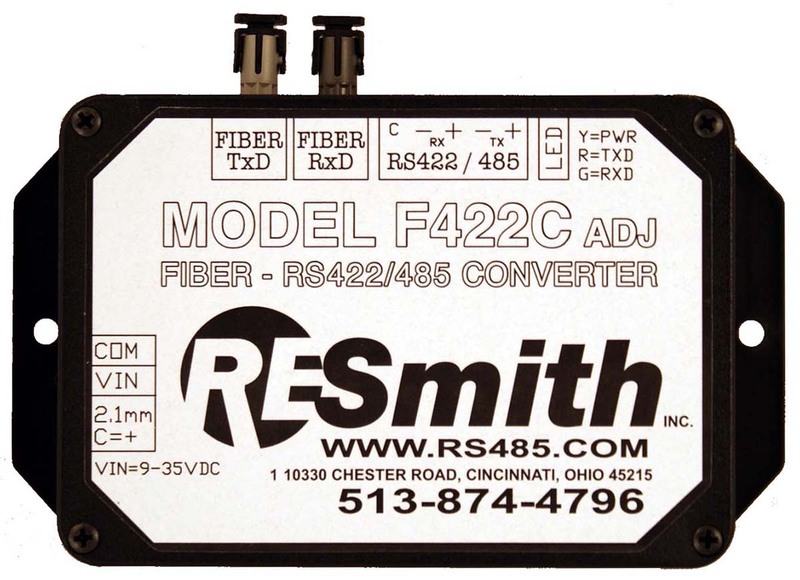 R E Smith, Inc. engineers and manufactures a comprehensive line of isolated and non-isolated converters, repeaters, multiport repeater hubs, fiber optic based products, and I/O boards. All our products are designed, built, tested, and shipped from our facility in the Greater Cincinnati Ohio area. We ship small quantities of most products from stock the same day, and larger quantities in a few business days. We listen to you. We are customer driven. Many of our products were developed and improved due to suggestions and feedback from our word-wide customer base. They are being used at the South Pole, at the bottom of the sea, at the edge of space, and everywhere in between. Typical uses are very large networks, monitor and control of elevators, machinery, lighting, security, fire and alarm, access, cameras, military ground support, and much more. We provide free technical support, no-argument warranty repairs, and recommendations for your application. Challenge us with your communications problem. We may already have the solution. If your system keeps failing, or is unreliable, we have isolated, doubly isolated, noise resistant, cost effective, and proven solutions for difficult environments. RS422/485: 5-position removable(or non-removable) screw terminal strip. Power: Barrel and 2 pin screw terminal strip. Protection: Robust Driver with built in ESD tolerance, and full wave transient protection. Distance: Fiber: 1Km Min, RS422/485: Up to 4000 ft. Size: 3.50" X 2.75" X 0.9" (PC Board), with connectors: 3.60" X 3.50"